Welcome to the Annual Report of Mourne Heritage Trust for 2016/17 marking the 20th anniversary of the Trust’s foundation in 1997. Along with four of my present colleagues – Isabel Hood, Maureen Killen, William John Martin and Arthur Mitchell - it has been my privilege to have served on the Board since the very beginning. In addition, a number of current members have served for almost as long while others whose tenure has ended also contributed across many of these years. Throughout, we enjoyed a continuous refreshing of our membership with representatives from sectors including local government, community development, environment, agriculture and tourism to name just a few. This reflects the combination of continuity and change that characterises my memories of the how the Trust has evolved – a combination that is also seen in the landscape of the Mourne Area of Outstanding Beauty that it is our mission to care for. For example, maintenance of countryside access across the area has been a constant from day one, but the scale and scope of the infrastructure has grown enormously, partly through the funding the Trust has levered. 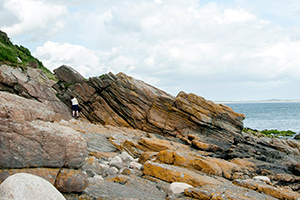 Likewise we have always sought to interpret the special landscape qualities and related heritage but the means by which this is done has evolved from the area’s first comprehensive suite of site interpretation panels to take in public art, websites, social media, apps and audio visual experiences. 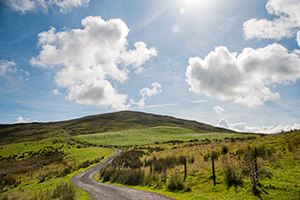 Numbers of people accessing the countryside, particularly in the high Mournes, has grown hugely and with it the scope of our visitor management work expanded from periodic small scale path repair to major erosion control and habitat restoration projects, which have also responded to the increasing impacts of wildfire and extreme weather events. We have seen aspects of our biodiversity come under pressure and while we have been heartened to see our efforts contribute to recovery of species like red squirrel, Mourne juniper and native woodland, much more remains to be done. Farming practices have modernised greatly since 1997 as well as responding to changes in agricultural policy. But it is still as true as it was the day the Trust was established that sustainable farming is essential to the future health of our landscape. While the availability of funding for our work has ebbed and flowed with the public policy and resource context, we continue to enjoy the support of our founding partners, namely Northern Ireland Environment Agency, our local Council - now Newry, Mourne and Down - and Tourism NI. 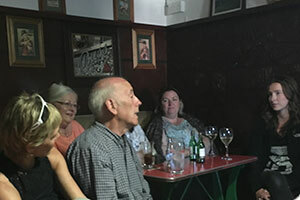 As with the early days, we continue to derive significant input from volunteers but the range of people engaging with us has become as diverse as the activities, thanks to programmes targeted at tackling social exclusion. Attracting additional project funds has also been a constant of our endeavours and we have filled the role of both disbursing funds to businesses and community organisations in the area and delivering our own initiatives. In this context I am pleased that after 20 years Mourne Heritage Trust is currently in good health and, moreover, continues to contribute to the well-being of our environment, society and economy. In 2016/17 our main funding streams not only stabilised after a period of considerable flux from 2015 but increased, notably that from our local Council - reflecting an expansion of our remit for visitor management in forests. Accordingly our staff complement is at its highest ever level. 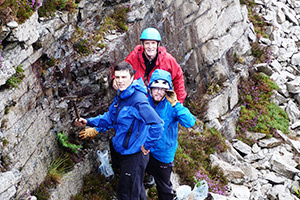 It is pleasing to note that as well as attracting some very capable new recruits in recent years we have been able to continue to blend that with the knowledge and skills embodied in a cohort of staff who have each spent a decade and more caring for Mourne. 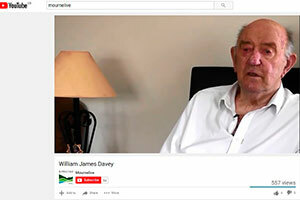 I cannot let this subject pass without acknowledging the particular contribution of David Keown who has recently retired having worked for five years past his official retirement date in the Countryside Officer function to which he had been employed very soon after the Trust’s establishment. 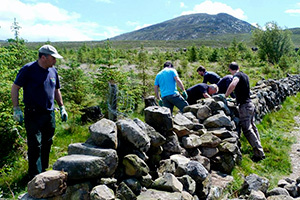 This year, building on our accumulated experience and capacity, we significantly progressed our work in areas including upland heath enhancement, native woodland establishment, juniper propagation, wildfire prevention, erosion repair and control, outdoor recreation infrastructure and service development, creating distinctive Mourne visitor experiences and connecting local people with their landscape related heritage in a variety of innovative ways. Much more detail of this work is set out in the remainder of this report. To conclude, I would like to reiterate my thanks to all who have contributed to our work both this year and - on the occasion of our 20th anniversary - over the two decades of developing the capacity to protect and enhance the much loved landscape of the Mourne AONB, to raise awareness of its special qualities and to promote sustainable local development. Mourne Heritage Trust was established in 1997 to meet an identified need for locally based, strategic management of the Mourne Area of Outstanding Natural Beauty (AONB). Spanning 570 square kilometres in the south east of Northern Ireland, this diverse landscape includes the Mourne mountains, a beautiful coastline, the ancient uplands of Slieve Croob and the foothills and drumlin country in between. 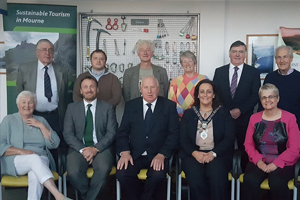 The Trust held its nineteenth Annual General Meeting on Wednesday 5th October 2016 at Tollymore National Outdoor Centre. 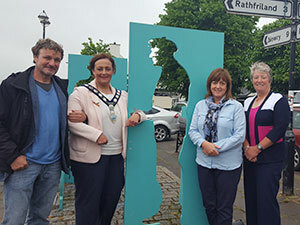 The meeting was opened by Chair of Newry, Mourne and Down District Council, Councillor Gillian Fitzpatrick, with the closing address from Ms Margaret Ritchie, Member of Parliament for South Down. 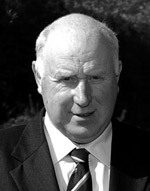 Mr Steve Brook replaced Keith Mackey as Forests Ranger and a team of Forests Countryside Officers was recruited comprising Mr Paul Campbell, Mr Dean Fitzpatrick, Mr Jim Martin, Mr Seamus Murphy. Ms Katie Taylor took up the post of Volunteer Co-ordinator. Ms Siobhan Thompson moved on from the post of Landscape Partnership Projects Officer. 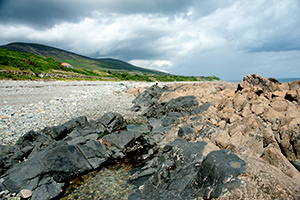 The framework for ‘Caring for Mourne’ is provided by the Mourne Area of Outstanding Natural Beauty (AONB) Management Plan and accompanying Action Plan which together set out the long term vision for what can be done to protect, conserve and enhance the most important aspects of the area’s landscape. The Management Plan was developed in 2010 through a review of relevant research to provide a sound evidence base and extensive consultation with local people and other stakeholders to provide further insights and build consensus. It is relevant to anyone whose activity or decisions affect the Mourne AONB and not just a plan for Mourne Heritage Trust. Therefore, while it is a non-statutory document, the successful implementation of the Management Plan draws on the commitment of various agencies and local stakeholders to pursue these principles in line with their abilities, priorities and resources. For each of these particular aspects of our landscape theme the plan outlines the special qualities of the area and sets out the broad approaches considered appropriate to maintain and enhance those attributes. The Action Plan goes on to set out specific actions to give effect to these approaches. By the end of 2015 the original Action Plan had reached the end of its intended life with progress assessed to have been satisfactory or better across 93% of objectives. In relation to individual actions specified under these objectives, 109 of the 137 in total had seen progress on or ahead of schedule. With a further 21 substantially underway, this left only 7 against which progress was limited. In the 2015/16 financial year, notwithstanding disruption caused by uncertainty around the Trust’s core funding, work was substantially complete on renewing the action plan and a draft had been submitted to Northern Ireland Environment Agency. Having identified some common issues arising in reviews of plans across a number of the NI AONBs the review process was paused to allow a window of opportunity for the Agency – in the context of the impacts of the Civil Service Voluntary Exit Scheme on staff capacity - to provide fully considered and consistent guidance. A new plan covering the period 2017 to 2022 is now complete and we look forward to making and reporting on progress against it with, of course, the continued support and involvement of our many partners in the public, private and community/voluntary sectors. While these final, important phases were completed MHT continued to deliver the ongoing actions outlined in the draft plan and also initiated new agreed areas of activity agreed with partners and/or for which funding had been attracted. So progress ‘on the ground’ has by no means stalled in that interim period. Attention was also focussed on a number of complementary planning exercises impacting on the AONB, notably the local authority led Community Planning process. The Trust was an active member of both the Community and Voluntary Stakeholder Group and the Environmental & Spatial Development Thematic Group. 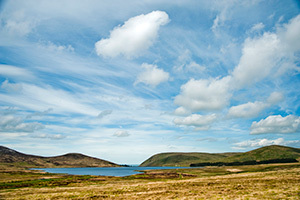 We also provided significant input to the Newry, Mourne and Down District Council Tourism Strategy, including participating in a three day study visit to the Cairngorms in June and a Tourism Strategy Workshop in September, as well as providing briefing and expert advice to consultants on issues related to visitor and landscape management. Other work to contribute to policy development, gather best practice and act as a ‘champion for Mourne’ is outlined below. Contribution to the NI Environment Link (NIEL) Economics of Nature group, primarily in design of a conference on natural capital ‘Delivering Prosperity through the Environment’, Belfast, June 2016. Briefing to various policy makers on the potential benefits of a proposed land strategy for Northern Ireland (as part of NIEL delegation) and Input (via NIEL Transition Group) to meetings with senior DAERA staff regarding the future strategic direction of environmental management. Agreement of a Memorandum of Understanding for the Northern Ireland Protected Areas Network and a programme of corporate engagement training with Business in the Community. Representation of landscape interests at Northern Ireland Tourism Alliance and Department of Communities Historic Environment Division Stakeholder Group. Engagement with visiting delegations from Pennine Prospects (South Yorkshire), Moors for the Future (Yorkshire Moors), Dutch fire service and Parks and Wildlife Service (Ireland). Input to Council for Nature Conservation and the Countryside workshop on management of environment based recreation in October 2017. Input to implementation plan for Department for Infrastructure Long Term Water Strategy. Information and advice to Newry, Mourne and Down DC and liaison with Geological Survey of NI and other stakeholders developing concept for a Mourne – Gullion Geopark application. Ongoing maintenance and updating of Mournelive website and social media platforms. 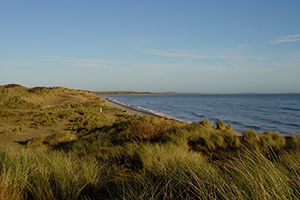 In addition to coordinating and monitoring implementation of the Management Plan and influencing strategic developments, the Trust’s role involves direct, day to day provision of significant landscape management and enhancement services and, where appropriate, developing and delivering one off projects. In the remainder of this annual report we focus on the subset of management plan activities led by and/or significantly involving Mourne Heritage Trust. Please note that, in line with the fact that the Trust’s work is multi-dimensional, some activities and projects are detailed more than once under different areas of operation. This reflects the contributions of our professional staff to different work streams and/or the fact that many of our activities to deliver multiple, complementary outcomes. Our work to protect and enhance priority habitats and species and key landscape features remains a cornerstone of the Trust’s operations. A particular focus in recent years has been on the high Mournes, involving both mitigating key threats and actively enhancing the condition of the priority habitats therein. 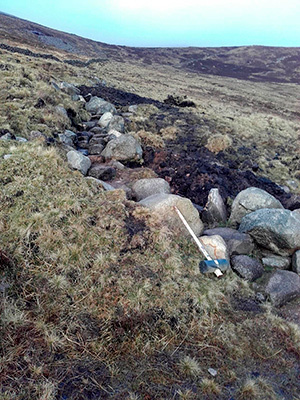 Detail is provided below on both our wildfire control and ‘Healthy Heathland’ initiatives which have pioneered landscape management techniques not previously extensively used in the Mournes and, in some cases, in Northern Ireland. But, as we also outline below, it has not all been about the high Mournes with red squirrels, native woodlands and other aspects of our rich lowland ecology, benefitting from the efforts of our staff and volunteers. This initiative saw the MHT Countryside team working closely with our Landscape Partnership officers to implement comprehensive management plans for key sites, selected for their potential to ‘test’ – and thus help us refine – approaches to move beyond simply arresting key threats like wildfire and erosion to actively restore priority upland habitat. Early in the year site visits and demonstration work with experts from Moors for the Future in Yorkshire enabled us not only to consider site specific approaches but to involve a range of stakeholders in some very constructive debates. 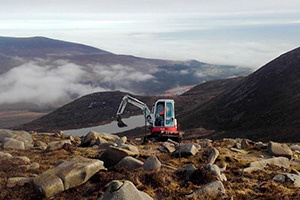 This informed detailed specifications for both machine and hand works at the col between Slieve Binnian/Slieve Lamagan and on sites adjacent to Binnian Lough. 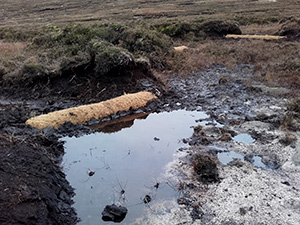 Contractors worked alongside our team to re-profile peat faces and emplace Geojute netting at the base of slopes and to position coir rolls on site to slow the movement of water and prevent peat washing through. Construction of stone dams complemented these interventions in places. Work also continued at previously treated locations such as the heath adjacent to the Silent Valley boardwalk and included sward turning to regenerate heather and the removal of non-heathland species. Attention then turned to post project refinement works and monitoring carried out by MHT staff, including liaison with Trinity College Dublin and fixed point photography re ongoing monitoring through a European project. 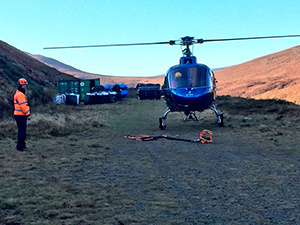 Tenders for helicoptering material and for further contract works for works at Lamagan col, over a 3ha site, and Binnian Lough, over approximately 5ha were developed and issued while scoping of possible sites for the next phase of works was carried out. An important development, after liaison with NI Environment Agency (CDP), NI Water and the Mourne water catchment grazing contractor, was agreement to introduce grazing by cattle at key sites, particularly to control the regrowth of molinia grasses and thus create optimum conditions for heathland regeneration. Galloway cattle were introduced on a 10 hectare site at Ben Crom and sites at Bloody Bridge totalling 6 hectares. Having pioneered (a Northern Ireland first) controlled burns in each of the previous two years, plans to further progress this method of removal of fuel load at key points in 2016/17 were undone by the weather and postponed until early in the new financial year. However, fuel load was further reduced at the Bloody Bridge lower control point with the mulching of gorse across 2.5 ha and preparatory site works completed to facilitate controlled burns in April 2017. Monitoring work at previously treated sites continued, this year trialling a template developed by our colleagues in Belfast Hills Partnership. Site works were also completed to increase the capacity and utility of our Mourne Wildfire Training Area at the Silent Valley depot which was made available to for training sessions to Northern Ireland Fire and Rescue Service. We also continued to input to the strategic development of approaches to wildfire control beyond our own locale. As well an Ireland-wide wildfire monitoring workshop and advice to NIEA on specialist wildfire equipment, we gave input to an international wildfire conference in Barcelona and facilitated site visits for, respectively, an international wildfire investigation workshop and for a fact finding visit by Dutch experts and Parks and Wildlife Service of the Ireland. Recognition is increasing internationally of the heightened threat of wildfire arising from climate change and shifting patterns of land use. We are pleased to be able to say that incidents of wildfire in the Mourne AONB in the last year have been relatively small in number and scale. However, events both on and beyond these shores show that we cannot be complacent about this threat. In addition, the work to reduce wildfire threat also aligns closely with our healthy heathland work, with the controlled burning of invasive vegetation often a first step to heathland recovery and we look forward to further developing these approaches in tandem. The aim for the Trees for Mourne project is to increase the percentage land cover of native woodland within the Mourne AONB. (Our Biodiversity Action Plan highlights that there was less than 3% native broadleaf woodland). Increasing the area of native woodland helps many other species including, buzzards, barn owls, red squirrels and the rare pine marten. We were delighted this year to receive an award from the Northern Ireland Environment Agency Challenge Fund for native woodland expansion and establishment that enabled us to build on the knowledge gained from the small scale planting undertaken in recent years and to capitalise of the burgeoning stock in our tree nursery. 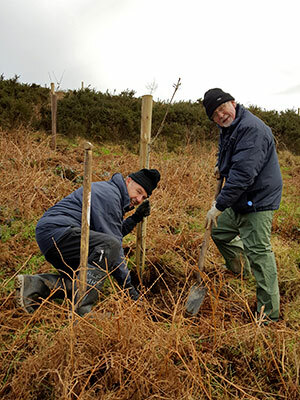 As a result 650 trees were planted on a 5 hectare area at Aughrim Hill near Kilkeel, a further 100 at a 1.2 hectare site at Banns Road near Attical and 200 trees at Glasdrumman. The Aughrim site is made up of unimproved grassland and scrubland with a few scots pine and mature oak scattered across. The hill is also very exposed to strong winds and so most of the trees, primarily oak and hazel, were planted on a south facing slope. 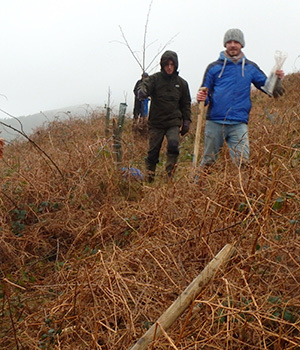 Works also included preparing the ground and inserting posts for future planting of scot’s pine and rowan at the higher elevations. At Banns Road the area planted is made up of both pastoral land and rough moorland on largely wet peaty soil around the Yellow Water river valley. Part of the site runs alongside the Eastern Mournes Area of Special Scientific Interest and planting was excluded from this particular boundary planted at this stage to ensure that the correct species were used to avoid the risk of unwanted species being seeded into the ASSI. The Glasdrumman site is primarily pastoral, cattle grazing land with significant wet boggy areas which were ideal for willow. 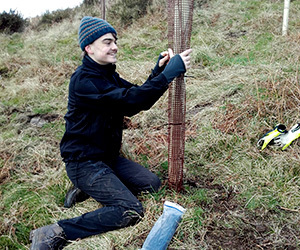 We also carried out remedial works to sites at Whitehill, near Leitrim, and Tullyree, near Bryansford, including removing stakes and fitting plastic mesh to trees which were planted between 5 and 7 years ago. It is an objective of the scheme that the increase in woodland cover does not impact upon the agricultural and economic viability of the land, so design and installation of appropriate sheep and cattle guards was an element of the work at all sites. The sites will in time be an additional habitat for birds of prey that in the Mourne plain and southern foothills, including peregrines and buzzards. Given Aughrim Hill’s close proximity to Mourne Park, the planting of this site can also act as a wildlife corridor and potentially increase red squirrel spread and numbers. 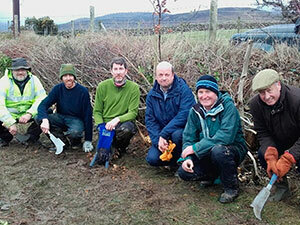 A key objective of the Challenge Fund element of Trees for Mourne was to involve volunteers. Tasks they contributed to included digging the trees out of the nursery, categorising into species type and size and pruning to an appropriate shape in order to fit them into the livestock guards. On planting days, we provided volunteers the opportunity to complete a course accredited by The Conservation Volunteers and this was particularly well attended by those who are currently unemployed and by adults with learning difficulties. 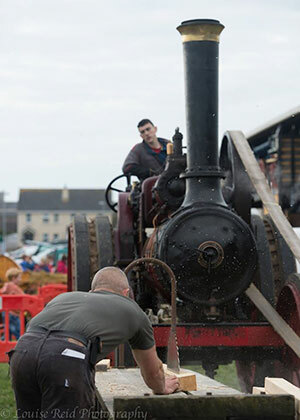 We hosted two “Turn up and Try” volunteer open days organised by Volunteer Now to engage a wider cross section of community participation and these proved popular with some of the local ‘Men’s Sheds’. Overall 50 different individuals provided 20 volunteer days and assisted in the planting of over 200 trees and with digging out and preparing approximately 500 trees. We are also pleased to report that, given many of the trees planted on our earlier trial sites are in areas exposed to the elements, some have confounded expectations in how well they have grown. We are trialling a monitoring system using GPS and GIS to monitor how well trees survive in differing environments and to find out which trees are most successful under Mourne conditions in, for example, wet areas or dry areas. We are also making preparations to diversify as regards the species of tree which we grow and, working alongside the Woodland Trust, we aim to have scots pine, birch and rowan to add to our nursery stock. 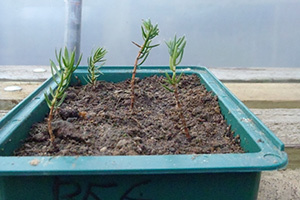 Again working in close collaboration with our Mourne Mountains Landscape Partnership, monitoring of the recent planting of 100 juniper specimens at three quarry sites around Drinneevar and Thomas’ Mountain revealed a good degree of success and we continued to care for nursery propagated seedlings to provide future supply. A key next step in development of our Mourne juniper programme is moving from propagation by cuttings to propagation by berries. Using our database of the established specimens in the landscape, we anxiously monitored berry production and with many remaining green for a significant time we began to consider that propagation from seeds was unlikely to be feasible. However in early spring some ripe berries were identified and permission obtained from NI Environment Agency to pick and use a number of these. Seeds were subsequently stratified - i.e. placed in a heat and cold in incubator to replicate the passing of several seasons - and a new propagation bed was established at our Dunnywater nursery. 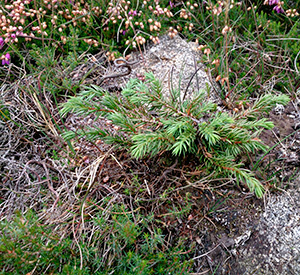 Cuttings were also taken as planned and we are pleased to note that previously unrecorded specimens – a possible future seed source – were identified at the Annalong buttress area. 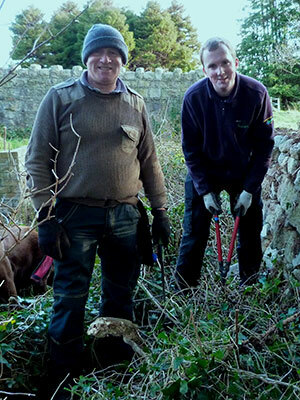 This year saw something of the end of an era in relation to our volunteer activity. The Active Lifestyles Programme, which had been supported primarily by BIG Lottery funding for the best part of a decade, reached the end of its second major tranche of funding in November 2016. 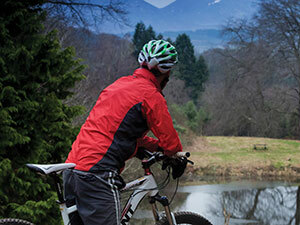 With input from an expert consultant we completed both an evaluation of the impacts of the funding to date and an Active Lifestyles sustainability plan. While developing the detail of some of the options for future activity emerging form this work, we were successful with applications to both the Baily Thomas Foundation and the Halifax Foundation for ‘gap’ funding to sustain the volunteering activity with particular special needs groups. We also continue to collaboration with several organisations including Volunteer NOW, Business in the Community and The Conservation Volunteers to deliver training and events. These measures allow us to retain the staff capacity and relationships built up while we finalise bids for more significant long term funding to be submitted in 2018. In total 820 environmental work days were achieved from February 2016 to February 2017 across all target groups, representing a value of over £40,000 worth of labour to AONB management. 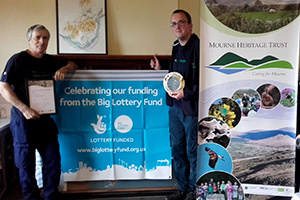 We celebrated the input of all our volunteers at our annual Mourne Natural Heritage Awards ceremony. This year the recipient of the individual ward was stalwart member of our volunteer path team, Alan Dawson, who contributes regularly throughout the seasons with never wavering enthusiasm, whatever the weather. 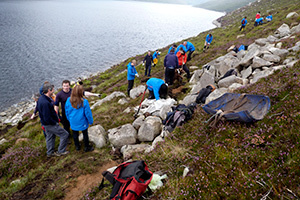 The group award recognised the contribution of Citibank who have been bringing staff to the Mournes for some years undertaking approximately 10 volunteer sessions annually, in activities that include beach cleans, heathland restoration, path work, litter picks, dry stone walling, tree planting and clearing invasive species. 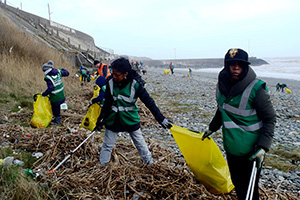 With from 12 to 30 people attending each session, this represents a significant collective effort towards conservation and environmental improvement. A key element of our natural heritage work is to raise awareness of special landscape qualities and biodiversity. 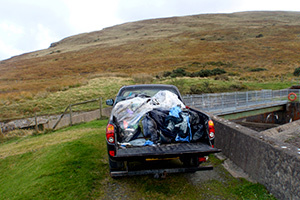 Much of this work in the year past was carried out in partnership with our own Mourne Mountains Landscape Partnership as well as with other environmental NGOs and local groups. The list below illustrates some highlights of this AONB wide work. Second and third level student placements developing skills in practical conservation techniques, wildlife ID etc. 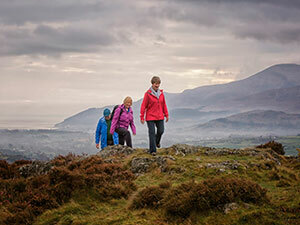 The mountains, hills, by ways, forests, parklands and coast of the Mourne AONB all continue to be hugely popular and important for outdoor recreation activities including walking, rock climbing, bouldering, coasteering and mountain biking, to name but a few. Thus an important aspect of our role is to facilitate access to this special landscape while monitoring and mitigating, in a variety of ways, potentially adverse impacts. The outputs collected and collated from our network of visitor counters for this year are set out below along with previous counts for comparative purposes. 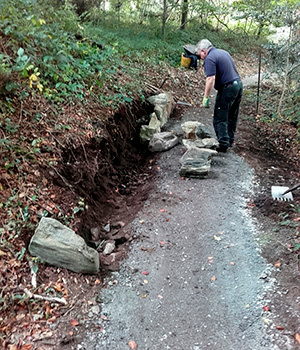 Glen River continues to be significantly the most used access corridor and hence we have undertaken some ‘stitch in time’ path repair works in that location, as well as commencing the Interreg ASCENT project (see below) which will seek to improve the visitor experience and management around Slieve Donard generally. The other main access route to Donard and environs, Bloody Bridge, saw a 20% increase in use over the year, further highlighting the need for attention to this particular locality. Decreases of just under that proportion have been exhibited at Ott (17%) and Trassey Track (19.7%) in the year. In part this is likely to be attributable to the fact that for a portion of the previous year (2015/16) the paid car park in the Trassey area - at Meelmore Lodge - was at times restricted in the course of works to expand capacity and, under agreement with Council, to provide free parking. An enforced temporary additional reliance on the Trassey and Ott car parks (which are nearer to the counters) may well be a factor in the higher 15/16 counts. In this context the overall numbers accessing the Ott/Trassey/Meelmore area may not have dropped as significantly as the raw counter data implies. In addition, we observed a particular spike in outdoor recreation events in the Happy Valley/Ott locality in 2015/16, may have contributed to an inflated count for that year. In concert with these observations it is worth noting that the 2016/17 count for Ott remains significantly higher than that for 14/15 suggesting that, notwithstanding the fluctuations in the last 12 months, a generally upward trend is evident over the longer period at that location. A year on year drop in numbers is also recorded at Carricklittle (just under a quarter). However, again over the longer term the figure here remains comparable with the 30,211 recorded in 2014/15. Of course external factors impacting on visitor patterns have a role to play – not least the weather – and we look forward to developing our visitor monitoring and understanding of patterns of use further to contextualise the data and complement our ongoing visual monitoring of the condition of access corridors. While our visitor infrastructure work spans amenity sites, green lanes and other trails across the AONB, a particular area of need in recent years has been the much used former quarry tracks and other access routes to the high Mournes and the mountain paths that emanate from them. Monitoring of 15 such access corridors was carried out throughout the summer season and where evidence of erosion was significant were identified in depth inspection was conducted. This included 1km of the Carricklittle Quarry Track, 1km from Binnian North Tor to Back Castles, 1km along the Mourne Wall from Carricklittle to Binnian Summit, a 1.5km stretch from the Binnian/Lamagan col to the North Tor and a 1.5km triangle around the south side of the Saddle of Donard, 1km of the Granite Trail and the 160m of new build section on the Cloughmore Trail, Rostrevor. Various ‘stitch in time’ works were carried out in these locations, while snagging of works at Bloody Bridge and Brown Knowe quarry tracks (initial works having been undertaken in early 2016) was also completed. However, with some locations exhibiting significant pressure, it was necessary to develop specifications for larger scale remedial works. 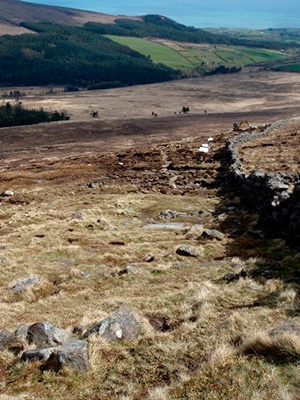 We were successful with an application to the Northern Ireland Environment Agency Challenge Fund for works on the track that runs from Binnian North Tor to the Binnian Middle Castles and that which runs parallel to the Mourne Wall on the lower slopes of Slieve Binnian from Carricklittle. 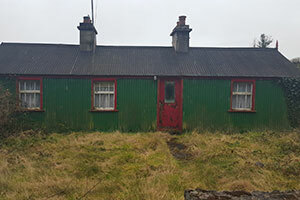 This provided for the costs of a 10 week consolidation / enhancement programme building on previous interventions, carried out by a contractor employing methodologies as instructed by Mourne Heritage Trust and based on the learning from the pots project monitoring of those previous works. In addition to the contract work a highly skilled volunteer contributed 8 work days under the supervision of our Area Ranger. As well as providing a robust and sustainable line for recreational use along 3km of trails, these works protect an adjacent heathland corridor that ranges from 5m to 20m wide. In another particularly heavily impacted location, the path ‘crossroads’ at the Binnian/Lamagan Col, we also finalised design and specification for 650m of erosion control requirements. These works, including both corridor repair and associated landscaping adjacent to the path for drainage and demarcation, were tendered and a detailed approach agreed with the successful contractors for works to be completed in 2017/18. 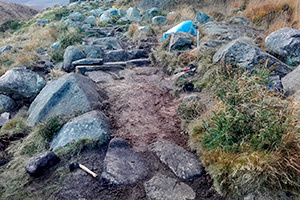 Other highlights of our upland work included habitat repair and preventative re-alignment of access infrastructure to address damage at Ott access corridor, completion by volunteers of a further 100m of the Ben Crom link path and further skills development through two path repair training courses in November 2016. As touched on above, we have been enabled to embark on a focused, holistic approach to visitor management around Slieve Donard through the European Union Interreg V Northern Periphery Area funded project ASCENT (Apply Skills and Conserve Our Environment with New Tools). This sees us sharing resources and best practice with Donegal County Council and various Scandinavian partners as well as our near neighbours in the Ring of Gullion AONB. Activity in the early part of the year focused on agreeing the detail of a work programme to allow funds to be released, with work really beginning in earnest in late 2017 with the recruitment of a Stitch-in-Time path team who made an immediate impact with erosion control works to the Glen River corridor, defining a sustainable path line in heavily eroding areas across 300m above the 3rd bridge. With our partners, we also began to make plans for enhanced monitoring of visitor pressures. Our activity in forest parks took on a new dimension and scale step forward with expansion of our remit to include walking trails, play infrastructure and additional forestry management functions adding to the increasingly evidenced need to augment our day to day management of the mountain bike network with major remedial and enhancement works. Accordingly a team of Countryside Officers was recruited to work primarily in these locations (the Forests Ranger having previously been assisted on a casual basis). Accordingly we took the opportunity to review monitoring and inspection regimes and all staff were trained in tree inspection techniques. In consultation with Forest Service we carried out a tree survey and management plan for the entire trail network and completed all specified tree safety works. 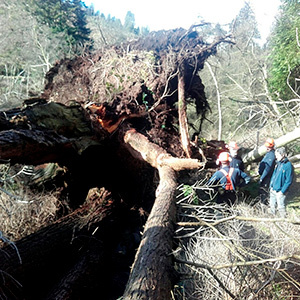 The completion of this major task was not helped by the very dramatic impact of Storm Doris in early 2017 in relation to fallen trees, but prompt and targeted action ensured trail closures were kept to a minimum. 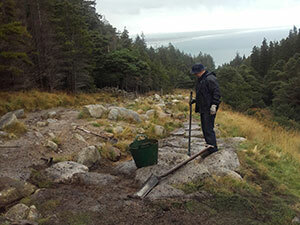 On the mountain bike trails a focus of activity this year was Downhill 1 at Rostrevor, known as ‘Mega Mission’. Refurbishments were based on user feedback and consultations upon and refined to improve ‘rideability’ and enhance the user experience. 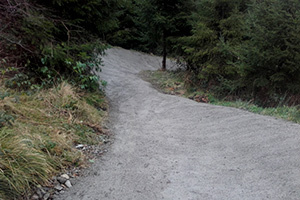 Further modifications to downhill trails were scoped and designed for implementation in 2017/18, subject to resources and various approvals. 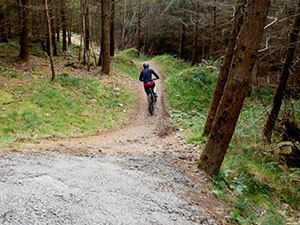 Smaller scale improvements addressing safety, drainage and trail flow issues were implemented in Castlewellan. 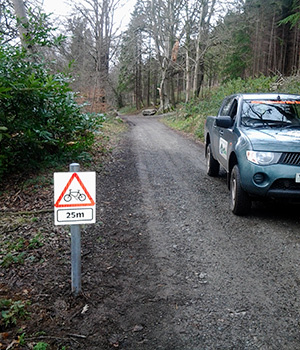 Adjacent to Rostrevor forest, we carried out inspection and snagging of boundary works undertaken in 2016/17 to control mountain biking on sensitive, open mountain areas at Kilfeaghan. We further developed the management of this interface by installation of ‘sheep grids’. This bespoke solution was designed to overcome issues of users exiting the trails leaving gates open and causing escape of livestock and has restored landowner confidence and contentment to continue to allow well managed and responsible access. We also worked closely with Forest Service, Council and users to develop proposals for dedicated horse riding trails, taking account of and addressing concerns about the potential for conflict with other uses. These attracted broad support and by year end required only some formalities to be completed in preparation for installation of the relevant way marking etc. 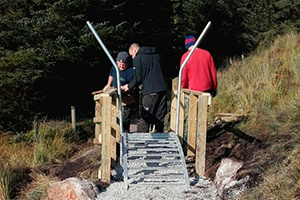 Looking ahead, in partnership with Council, we developed a tender for an exercise to scope further development of the paths network in Kilbroney Park and Rostrevor Forest and by year end work with the appointed consultants was substantially complete. 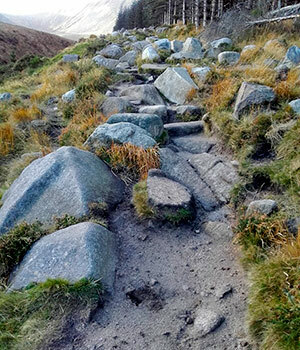 Implementation of a voluntary best practice code for way marking of events in the Mourne International Walking Festival and liaison and advice to private sector event organisers. Programme of evening and weekend patrols in high season at environmental hotspots in the countryside. Liaison with landowners and outdoor recreation providers on impacts of bouldering activity at Bloody Bridge and agreement of remedial actions. Agreement in principle of a Code of Conduct for bouldering (in partnership with SportNI). 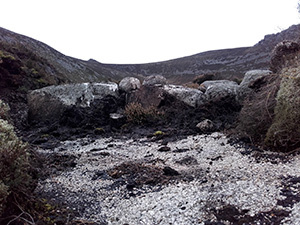 Site meetings with Mourne Outdoor Recreation Forum (MORF) to observe event way marking, to examine erosion and visitor management at Ben Crom and visitor management issues at Glen river corridor. 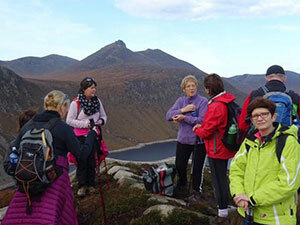 Input – based on our Mourne Strategic Path Review and other monitoring work – into Community Path consultations and scoping study for Mourne and Slieve Croob District Electoral Areas, carried out by Outdoor Recreation NI on behalf of Newry, Mourne & Down DC. Inspection and maintenance of long distance walking trails – Mourne Way & Newcastle Way (26 and 28 miles respectively) - and key walking routes, including recently upgraded Granite Trail (3 miles) and Silent Valley Nature Trail along with 19 other accredited Quality Walks. Significant clearance of encroaching invasive scrub along the Mourne Way at Fofanny and provision of stile to address erosion. Vegetation control on 43 Public Rights of Way representing over 37 km of green lanes. 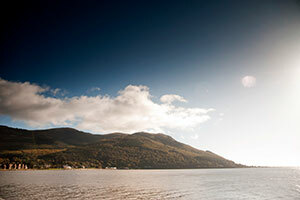 The landscape and related heritage of the Mourne AONB is this area’s major attractor and our sustainable tourism work continued to facilitate delivery of authentic Mourne experiences. Key themes, but not the only ones, were Narnia, Mourne granite and the Water Story. 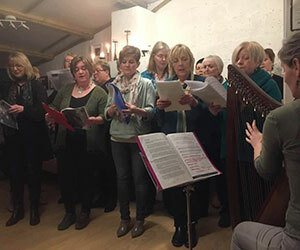 As well as development of product and interpretation collateral, a wide variety of events – from adrenaline high mountain biking to more sedate crafts, local stories and music – were provided. We also monitored visitor numbers and patterns, gathered heritage information and stories to share with tourism enterprises and worked with partners to assess ambitious plans for possible new visitor attractions and services. We have summarised the highlights of these activities below against Tourism NI’s experiential tourism pillars, which have guided the development of our activity. 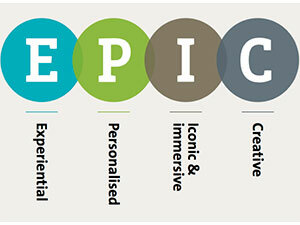 ‘Making our history, legend & stories alive and interactive’. 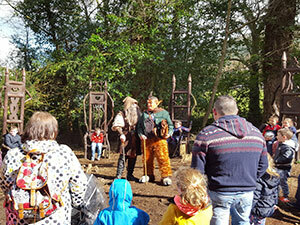 Narnia Family Fayre event held on Easter Monday in Kilbroney Park, highlighting the Narnia experience alongside celebrating the Year of Food and Drink. CS Lewis themed Murder Mystery in the Rostrevor Inn, November 2016. 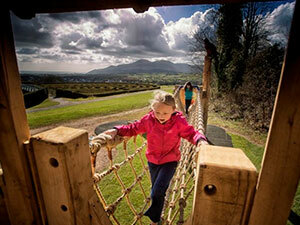 Kilbroney Park Tree Trail designed in consultation with local community and guide content drafted. 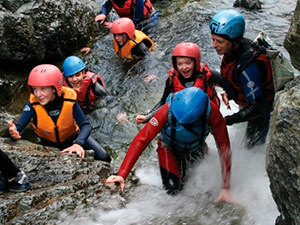 ‘Becoming a distinct outdoor recreation & adventure playground’. 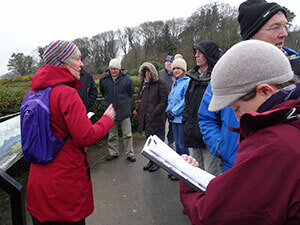 ‘Step into Spring Day’ at the Silent Valley in partnership with NIW, where the heritage of the Valley was celebrated through various activities including guided tours. Completion of second phase of local guide training and ongoing support to guides with research, FAM days, establishing commercial basis etc. In the course of this year we also provided input to some significant initiatives that contribute across the various experiential themes. This work in turn divided into two main aspects: policy and strategy development and scoping/ pre-development work. Our continued input to the Newry, Mourne and Down District Council Tourism Strategy included attendance at three day best practice study visit to Cairngorms in June 2016 and strategy workshops as well as provision of expert advice to consultants on issues related to visitor and landscape management. We also provided input to a Northern Ireland Tourism Alliance Workshop at Titanic Belfast. 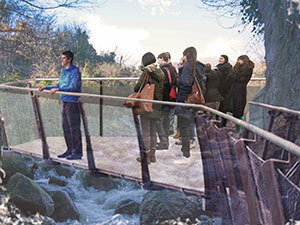 Also under the lead of Council, we contributed to all stages of a Mourne Gateway Access Study to examine the infrastructure & sustainable visitor services required to enable Newcastle to function as a gateway to the Mournes, enhancing links to the surrounding mountains, forests and coast and considering the possibility of major attractions linked to the inherent landscape qualities. Our work included assistance with procurement of an appropriately qualified consultant team and progressed to information provision, assistance with consultations and critical review of project vision, concepts, proposed developments and cost benefit analysis respectively. By the year end a suite of proposals had been produced for enhanced access and infrastructure at particular opportunity sites. This year was the fourth of what had originally been planned as a four year programme. We were delighted to agree with HLF an extension into a fifth year. This is facilitated by our success in attracting match funding and in delivering a number of the intended project outcomes in a cost effective manner, thus enabling budget to be deployed over a longer period and additional outcomes targeted. The following projects illustrate the range of people with which the Landscape Partnership has engaged. The second cohort of tour guides completed our bespoke Open College Network accredited guide training in April 2016. This brought the total number of guides trained to 24. To further encourage local guiding activity, a number of guided walks were arranged in October 2016, which proved to be a great success. 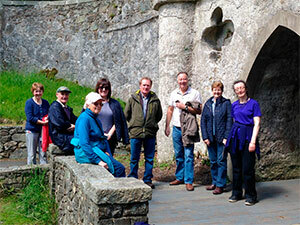 This gave the trained guides some experience in delivering their chosen tours and was also a good confidence builder. By year end, plans were underway to develop a comprehensive programme of walks, to be delivered between June and October 2017. The spring/summer term of 2016 completed the Built Heritage workshops for primary schools (delivered by the Ulster Architectural Heritage Society). A further 14 workshops were delivered during this period bringing the total number of workshops to 25 in which 567 children were engaged. The teaching pack that accompanied the workshops will provide an ongoing resource to schools, concentrating on local built heritage as opposed to structures from further afield. 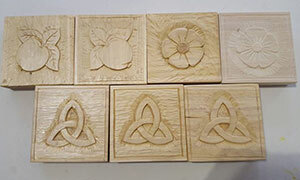 The autumn term had a change of focus, with workshops taking on a Cultural theme. This programme offered greater variety of choice to schools. A “Menu” of cultural facilitators was provided and the schools chose which activity fitted best with their existing focus. A broad range of activities were offered including storytelling, weaving (peg and handloom, as well as willow weaving), clay/ceramics, drama, music, song writing and poetry. 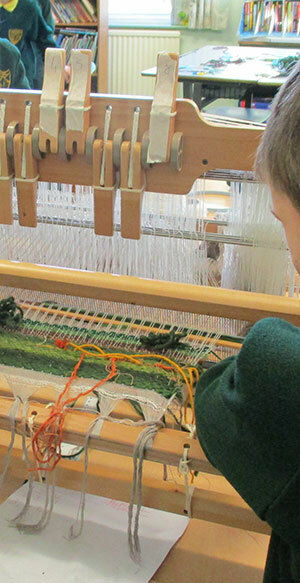 A total of 23 workshops were delivered to locals primary schools, engaging a total of 667 pupils. The early years of the landscape partnership programme concentrated particularly on capital projects and practical conservation measures which provided focal points for the engagement of people and training opportunities along the way. The more recent years then saw a shift in emphasis towards leveraging the value of these works in terms of participation and understanding, with activity in Programmes B and C below particularly significant in 2016/17. However, conservation works and training - Programmes A and D below – were still also significant in the year, notably through the progress with our Healthy Heathland work. 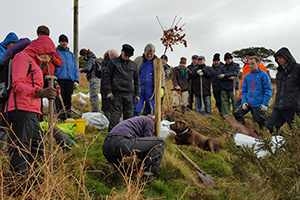 This programme aims to enhance the condition of the heathland mosaic, support the propagation of the unique and endangered Mourne Juniper, alleviate the legacy of erosion and restore vulnerable features of the built heritage of the Mournes. 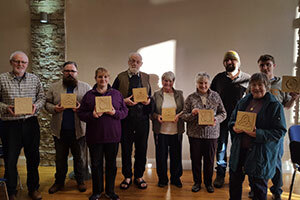 This programme aims to create participative opportunities for communities which reunite people with the landscape and traditions through a variety of mediums. This programme aims to improve access in the physical and intellectual sense. 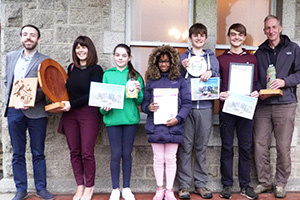 The creation or enhancement of “trails with tales” raises awareness of the heritage of the area while a diverse range of events and activities allow people to engage with heritage in ways that suit their interests. 23 Cultural heritage schools workshops delivered between October 2016 and March 2017, engaging 667 pupils. 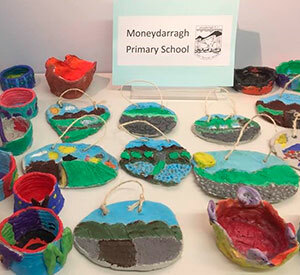 Clay models created by Moneydarragh PS displayed in Kilkeel Library for the month of November 2016 (alongside the Big Weave project). Work commenced with Newry & Mourne Museum to compile information for a book on old traditions, sayings/phrases, games, food etc. Work commenced on a number of educational/ interpretive materials including the Tree Trail in Kilbroney Park, Hilltown heritage publication, Rostrevor heritage trail, Narnia kids activity sheet and educational resource for Annalong Cornmill. This programme aims to develop the knowledge and skills of the communities of Mourne so that their ongoing contribution will help to create a legacy for the project and that their efforts will help to conserve the natural, cultural and built heritage of the area. 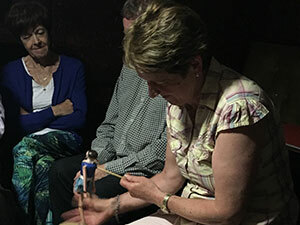 Hearthside Heritage Training provided a broadened range of 30 workshops adding wood carving and patchwork cushions to willow weaving, drawn thread, Mount Mellick embroidery, hand weaving and Carrickmacross Lace. The website also includes links to and from our various other online mechanisms as listed below. We would like to record our sincere gratitude to all our generous donors and to all of those who support the Trust with their time, our wonderful volunteers. Donations come through mechanisms including collections by walking groups, proportions of entry fees to mass participation events and from generous individuals. For people interested in making donations we have established a JustGiving account online. 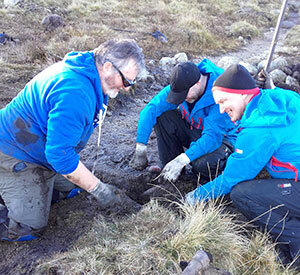 Alternatively, for volunteering opportunities please contact the Trust office where staff will be pleased to discuss how you can support our work in Caring for Mourne in line with your interests.